You Save: $2.04 (14%) Ships in 1 day. Publisher: Camino Books, Philadelphia, 2008. Soft Cover, 224 pages, 5.5 x 8.5. If you've ever wanted to explore the hopping beer scene in Philadelphia, now is the time. Fun and full of attytood, Joe Sixpack's Philly Beer Guide is the perfect companion for this city's thirsty visitors and locals alike. 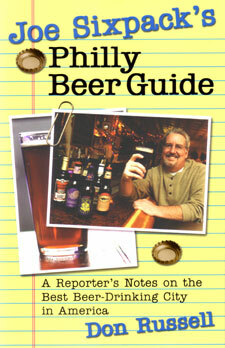 Joe Sixpack is Don Russell, who has written a weekly beer column for the Philadelphia Daily News since 1996. It goes without saying he knows, and loves, his beer. Over the years, he has traveled to Belgium, France, Iceland, Israel, Austria, the Caribbean, and throughout the United States and Canada in search of great beer and great stories. But he always comes back to Philadelphia, where the first brewery was built over 300 years ago and where great beer has been brewed ever since. Discover the full flavor of a great beer town. Go barhopping with Joe Sixpack, and you're sure to get all the insider's tips: The best brewpubs, breweries, and beer bars; Barroom secrets and money-saving tips; Walking tours with maps; Festivals, here and abroad; And lots of fine, cold beer! Before you duck into a tavern, grab your copy of Joe Sixpack s Philly Beer Guide and learn why Philadelphia is the Best Beer Drinking City in America. Joe Sixpack is Don Russell, the award winning columnist at the Philadelphia Daily News. Born and raised in the City of Brotherly Love, he s spent more than 30 years researching his favorite topic: Beer!